See the details of my $200 a month grocery shopping trips and learn the things that I do to save and live well on a low grocery budget with my family of five! This week you’ll see that I saved significantly by using money saving apps like Ibotta and Checkout 51. 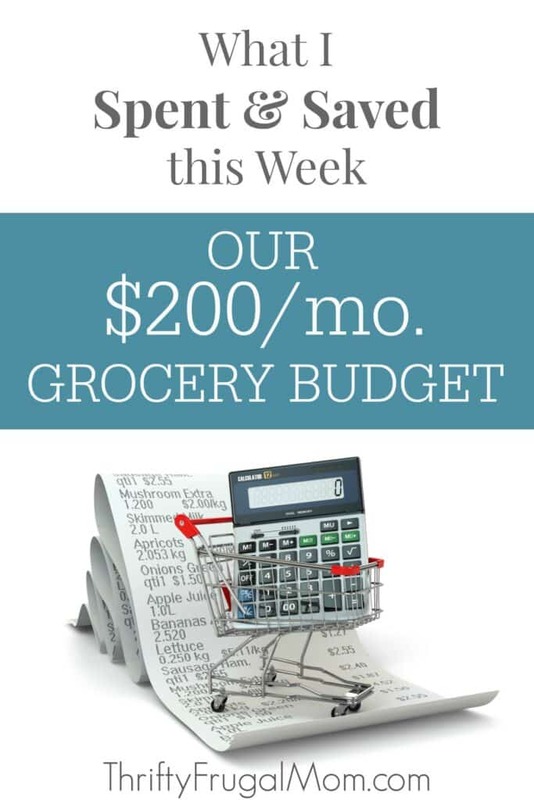 While these kinds of apps aren’t going to make you rich, in my opinion they are an easy way to save and I love being able to use them to stretch my grocery budget. If you aren’t using these apps, right now is a great time to sign up since both are currently offering sign up bonuses. For a limited time, Ibotta is offering a $10 credit to new users who redeem their first offer within 14 days! It was a good week at Giant! And before I forget, you should be able to get all of these deals yourself (other than the Cabot cheese) through Thurs. 6/23/16. A while back I received a short survey from Cabot cheese and in exchange for doing it, I got some coupons from them to use on their products. I was disappointed when I got them because they said “Do Not Double” on them and I knew that would make it much harder for me to use them and get a good deal. But I got lucky and Giant had a deal last week where you saved $10 instantly when you bought $20 worth of Cabot cheese. I found some printable Cabot coupons and by combining them with the coupons that I received from the manufacturer as well as the sale, I was able to get a great deal and paid just $1.63/lb. for the cheese! I was grateful, because I was on my last block of cheese and really like not having to pay more than $2.50/lb. which can be a bit tricky. I did have to get a rain check because they were totally sold out the day that I went shopping, but it wasn’t a big deal, because they were well stocked this week. Oh and the Enjoy Life bars were just an item that I was able to get for free by combining a coupon, sales and app offers. You can see the details of that below. The Checkout 51 offer may only be available today yet, since those offers typically reset on Thurs. Other than the milk, the other items that I bought were all part of Giant’s gas deals. Basically, with these deals you earn savings on gas when you purchase a certain amount of specific products. So while my initial out of pocket might be higher, once I get the savings in gas, it makes or some really good deals! 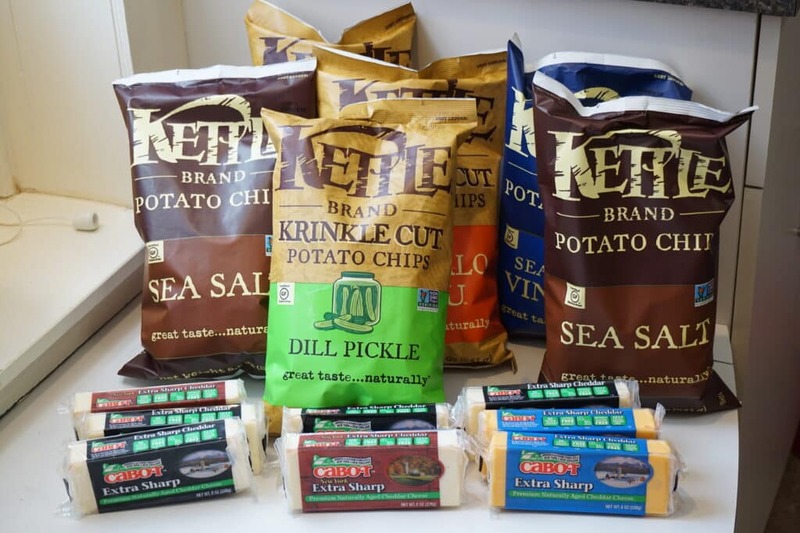 The Kettle chips ended up being a money maker of $1.50 after coupons, sales and gas savings. We love these chips and most of their flavors are GMO free too, which is nice. Just today we tried the Dill Pickle ones and they were really good! The Classico pasta sauce was a money maker of $3.67. I am positive that I printed out more coupons for them, but can’t figure out what happened to them. I had hoped to buy at least another 4 since pasta sauce is something that lasts for pretty much forever, but I’m glad I could at least get these 8. The deal was buy 6 and get enough gas points to save $12.50 in gas. 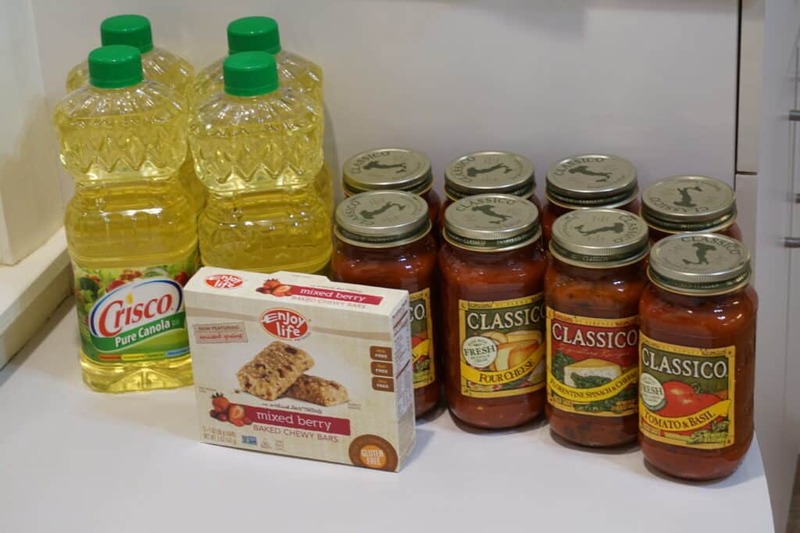 So the since I had two coupons for 4 pasta sauce each, I added some Crisco oil that were also part of the gas deals to get my 6 items the second time. After gas points, I paid $0.91 for the Crisco canola oil. Since this is something that I use regularly, I was happy to get it for such a good price. I usually buy it at Aldi and it’s never cheaper than $1.79 a bottle there, so this was decent savings. I love stocking up on diapers when I can get them for $5/pack or less. By stocking up when they are cheap like this, I never have to pay full price and save a lot! Recently there were $3.oo printable Pampers coupons available. I haven’t seen that high value of coupons for diapers in a long time! I didn’t know of any deals for Pampers right then, but went ahead and printed them hoping that I’d be able to use them before they expired. So I was pretty happy when I saw that CVS had a deal where you got $10 Extra Bucks when you spent $30 or more on certain items and Pampers were part of the deal. Then, amazingly, Checkout 51 had offers on Pampers too! So, by combining the sales and coupons, I paid just $1.99 for each pack of Pampers! If you are interested in doing this deal, the sale is valid through Sat. 6/25/16. 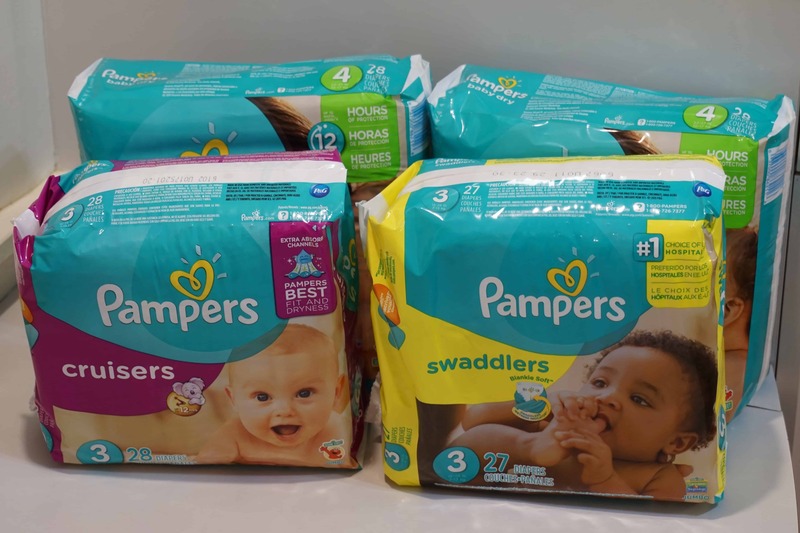 The $3.00 Pampers coupon is regional and isn’t available for everyone, however, I think that if you don’t see the $3.00 one, you’ll have one for $1.50 that shows up. Also, Huggies diapers are also part of the deal and there are $2.00 Huggies printable coupons that you could use and still get a pretty decent deal. You did great at CVS, it's my favorite deal store. I've been getting Kraft cheese at the commissary for $3 a pound which is good price here. Not that long ago, $2 a pound for cheese was my purchase price. Rising prices keep us homemakers on our toes! Yes, I was very happy with my diaper deal there. Some of my friends got a coupon on the CVS app for $5/$25 diaper purchase that they were able to use too. That would have been awesome! But I still was very happy. :) And yes, cheese prices keep rising, for sure. I used to have my buy price at $2/lb. too but have had to slowly raise it. I'm blessed to live in an area that has several Amish bulk food stores and discount grocery stores, so I amazingly am still able to hit the $2/lb. price thanks to their good deals. But most of the time, I end up paying closer to $2.50. From what I know though, your $3/lb. buy price is doing well for most parts of the country!